We are certainly going to learn how far one couple go about doing things differently from most with their HDB flat. It’s a HDB residential at a city fringe housing estate “Rest of Central Region”. 5-10 minutes walk to MRT station within 5 stops to Raffles Place and Downtown Stations. Within 5-15 bus stops to China Town, Orchard, Dhoby Ghaut, Bugis, Shenton areas. It looks a good location for a lot of people working near town. 5 stops from Raffles is great if your job involves a lot of overtime. I cannot gauge how far 15 bus-stops is but 5 bus stop is very close. The tenants that the owners rent to should be folks not owning a car so the consideration for close proximity to expressways are not high considerations. If you are purchasing your next HDB flat, this is a good reference for some consideration if you are looking to fetch a good future resale value or rent out a few rooms. Mortgage Loan: $488,000. This is a 30 years loan, where interest rate is fixed 1.58% for the first 2 years, with free option to extend fixed for another 2 years and floating rate thereafter. This loan is repaid with cash. Cash Loan: $140,000. This loan is to cover the down payment for the flat, COV, lawyer fees, renovation and furnishing. This means that the owners did not cough out much cash down payment out of the pocket. This is a 4 year loan at 6.2% fixed interest. Automated income and expense setup: The owners contribute a total of $3,500 to a joint account to repay the loans each month. Tenants pay to the same account as well. From there, money to service loan and instalment, utilities, wifi, property tax, reducing term insurance , conservancy fees. Fees are paid by GIRO where possible so as to save time and effort so bills are rarely tracked. $3,300 out of the $3,500 goes to servicing the cash loan. The rooms were largely rented out for the year. They were on a 1 year loan tenure. This brings to the owners a steady rate of $3,450 gross rent per month. The owners felt that they manage to rent out above the market. If you look at this arrangement, it looks to fetch close to that of a flat that was rented out fully to a family. Note that the monthly pay off of the $3,300 per month cash loan is not recorded here. That is to tackle the down payment, and in the case of normal property, that was assumed to be paid out of pocket and there fore not part of this equation. Usually, we pay a fixed mortgage and in this case the couple paid $1,700 per month, but in this table the principal repayment and interest are broken up. This is so that they can compute the net rental income yield versus the cash on cash yield. The net rental income computes your earned return from purchasing this property. Net rental income is gross rent – expenses + repayment. In this case the net rental income is represented by Total Income (including repayment) where the annual net income is $21,969. The cash on cash is basically the free cash flow, factor in the principal payment which you have to pay the bank. What is left over is for you to do as you please. In this case it is represented by Net Cashflow where the annual yield is $9,099. It would seem that the owners are not making much of a capital gains from this property that amounts to anything significant if they bought it for $628k and the prevailing selling price is at most $600k. Based on the equity of $85k, the net rental income yield is 25.7% (21.9/85). This is why property is great because it is the few investment assets that banks are willing to lend you. In this case the owners are 86% net debt to asset. This is much higher than the norm due to the owners taking a cash loan for the down payment. Based on the purchase cost of $628k, the net rental income yield is 3.48% (21.9/628). This property was purchased at a high valuation and as such the yield is low, for a HDB flat, which usually looks to rent 5%. 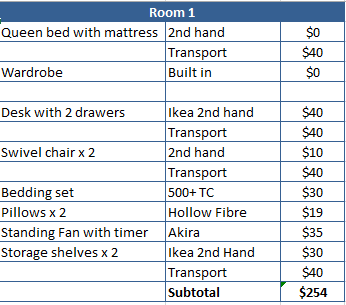 The question is if you rent out the whole 5 room flat can you fetch higher than $3,480 per month. Based on the current value of $550k, the net income yield is 3.98% (21.9/550). The cash on cash return looks good in that, the rentals pay for the mortgage and if you compare to what most people are doing, they do not have to pay the mortgage from their take home pay. They do one better than the rest of the folks by letting their CPF OA grow at a low risk rate of 2.5%. The cash on cash return, however was not able to offset their $3,300 per month cash loan. If you look at their leverage ratio you can see that they are taking on a lot of debt. They better do their risk management well. Think of this that if they are unemployed, they will have to come up with $3,300 + $1,700 = $5,000 of monthly cash flow. If they failed to rent the rooms out, that is a serious problem. If they manage to rent out they would still need to come up with $2,600 per month cash to pay off the cash loan. That looks no different from a typical couple using $1,200 of their CPF to pay off their mortgage. Until you realize that this cash loan is footing their down payment. In the end, because they did not come up with cash for down payment and the addition of rental income, plus that they need not buy another place, they should have adequate money in CPF and perhaps cash as contingency to pay off the cash loan if it is necessary. 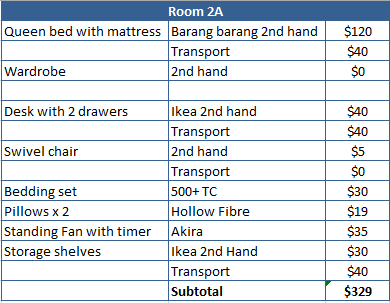 I find the furnishing and renovations section of what he provided to be interesting. The owner renovated and furnish the setup for a grand total of $10,135. One thing to note is that your mileage may differ because it really feels like this is a resale flat based on the information provided below. Note that you will see a lot of transport. 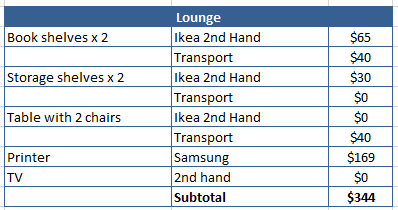 From my interpretation that is the cost of bringing the stuff from second hand seller back home. Funny thing is that they don’t seem to need a stove, or is that built in. 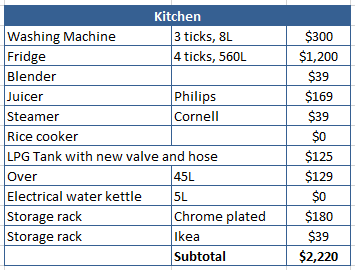 The kitchen just happens to be the most expensive one. I appreciate it a lot for them to put how many ticks the appliances is. At times, I am wondering to myself whether I should be more surprised by the level of discipline the owners put into their idea of what a home looks like. This certainly looks like a home built firstly to rent, rather than to live in. If you are renting, your tenants are likely to not hold strong affection to the furnishings, so even if you get the best furnishing, they would not be the best people to take care of it. So why spend a chunk of money on it. I look at this to show the options available for those that are on a tight budget. When you are on a tight budget if you are not earning near the median income, you have to be responsible, and control your expenses, focus on a few things you value the most. What the owners did here is a bit over the top, but it is still a very liveable place. What the owners are doing are technically not very legal. Even for a 5 room flat, the stipulation is that only 2 rooms can be rented out and the owners have rented out 3 rooms. So I don’t encourage others to do this. If there is one main take away, it is that this case study showed how far some would wreck their brain to come up with a plan to put themselves in a financially better position. The end game here is that the couple own a flat that is paid for by the tenants. After four years, the cash loan would be paid off and the couple gets income to supplement their main income stream. For 4 years of pain they would eventually free their main income stream to channel further to wealth building. What made this possible was a willingness to compromise and rethink their idea of the ideal home, much different than how the majority of the people look at it. I would like to thank my reader for compiling and providing such detail data. Its good to know I am not the only data nut around. Are there any points I missed out? Do share your thoughts with me. If you have a case study to share with readers do email me as well. Why can’t we learn to be financially savvy to earn good return on our investment portfolio and still proudly own our home and exclude it as investment vehicle? It is better to crack our brain on our investment portfolio. Home sweet home and pocket still full of money. No? A very thorough and interesting post and couple there. It’s good that this couple found a method that works for them (I’m assuming they are happy with the arrangements of living with strangers). I guess there are many roads that lead to financial freedom (though this is certainly one less trodden). 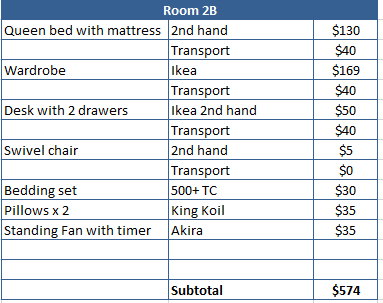 Wow..I didn’t know HDB owners can convert the living room and turned into a bigger room. I am curious, is it legal for them to rent out all 3 rooms? I know some people would also convert a HDB room into 2 rooms and rent out to 2 tenants, each for the individual ‘room’. Risking your entire flat for that extra income is quite silly, and I don’t think you can get that rental for rooms now. But kudos to them! Hi Ah Kong, and its not really legal. according to articles, they say those places closer to town have more resilient rentals, let us see if this is really the case. This was great information! Thank you for sharing.